Is art of hospitality. Is dedication and passion. Is desire to make every guest at ease. 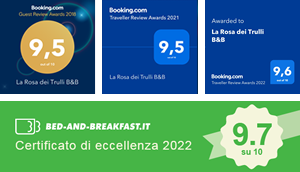 The breakfast here, at “La Rosa dei Trulli”, for example, is a feast of sweets and delicacies of every kind, all strictly handmade. The flowers to celebrate and a smile to wish you good morning. This is a real moment of relaxation. Pamper yourself! Matarrese family can advise you on the best places to visit and the dishes to be tasted, identifying the fastest route and the best restaurants in the area. La “Rosa dei Trulli”, also, organizes excursions and guided tours along the nature trails of the area to lead to the discovery of poorly known places, but not devoid of charm.